The term sapphire without a colour prefix is reserved only for the blue variety of corundum, coloured by iron and titanium. All other colour varieties of corundum are either described by using a colour prefix, e.g. yellow sapphire, orange sapphire, pink sapphire, and purple sapphire to name a few, or by the generic term ‘fancy sapphire’ for further fancy colours (e.g. bluish grey, greenish yellow, reddish pink). Padparadscha sapphire is a variety of corundum from any geographical origin whose colour is a subtle mixture of pinkish orange to orangey pink with pastel tones and low to medium saturations. Sapphires form either in metamorphic environments or in magmatic (basaltic) deposits. Main producing countries include Sri Lanka, Burma, Madagascar, Australia, Vietnam, Tanzania, Nigeria, Laos and Thailand. Some of the most famous and expensive sapphires in the world come from Kashmir (India), though the mines there have not been active in recent decades. Many sapphires today are treated to enhance their colour or transparency, and synthetic sapphires are also present on the market. The photo of a sapphire depicts the gem at the time of testing. The photo on an SSEF report is for representational purposes and does not necessarily represent actual colour, clarity or size. For size comparison purposes, approx. magnification used is provided under the photo on the report. Weight of a sapphire in carats, measured and stated with 3 digits. In the case of mounted jewellery, total weight corresponds to total weight of jewellery item(s) and is stated in grams. Estimated weight is an estimation -for example- for stones mounted in jewellery. The actual weight of a stone may be different to the estimated weight and can only be determined unmounted. The shape and cut describe the outlining shape and cutting style of an examined gemstone. For jewellery items with several stones, a range of shapes and cuts may be stated, if these vary. The measurements are given at 2 decimal places. They generally represent length x width x height of a gemstone. For series of gemstones or gemstones in jewellery, a range of measurements may be stated on the report. SSEF only uses descriptive terms for sapphires (i.e. colour and saturation). The only trade name that is applied is ‘royal blue’ which can be granted to unmounted sapphires of blue of strong saturation that match all SSEF criteria. or a detailed description of SSEF’s royal blue criteria see here. 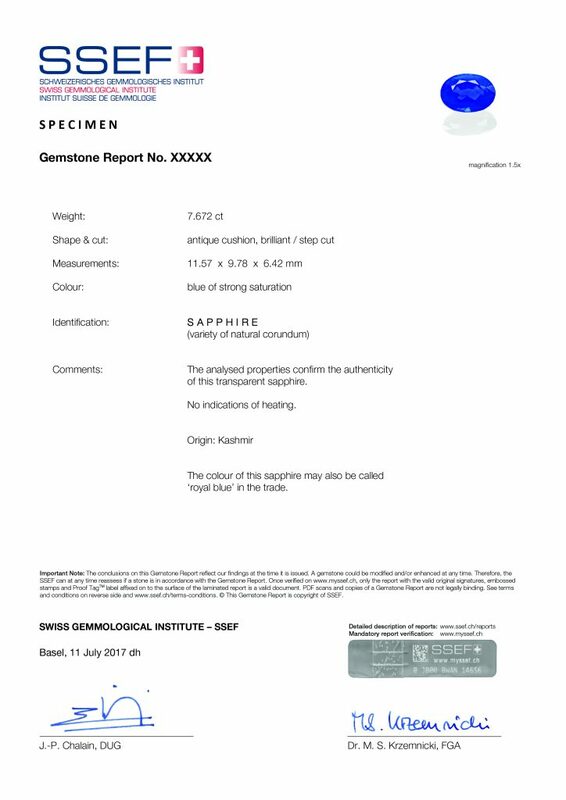 A synthetic sapphire would be clearly identified and labeled on a report in the identification section. Sapphires are quite often treated to improve their appearance. These treatments include fissure filling (e.g. with oil), heating, heating with a flux, heating with lead glass filling (rather rare), and difussion treatment. As we follow a full disclosure policy, all these treatements detected at the time of testing, will be described in the comments section of an SSEF report. If no heat treatment has been identified ‘no indications of heating’ is written on the report. 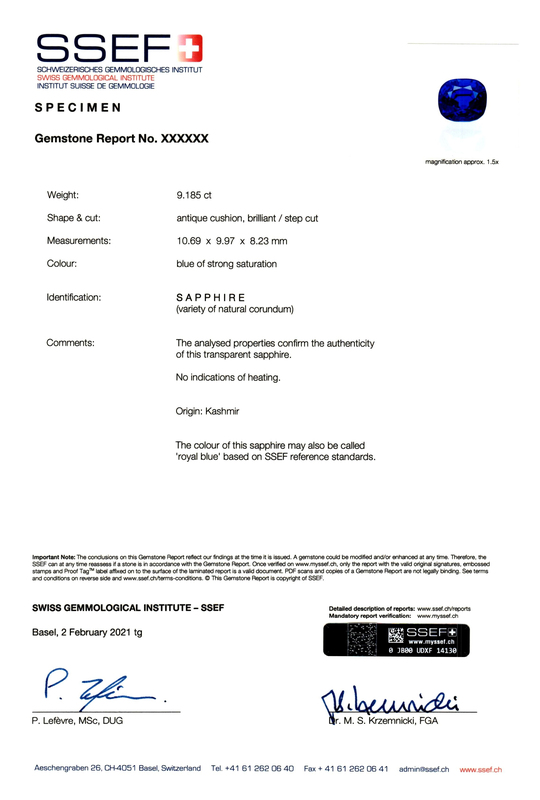 If heat treatment has been detected through gemmological analysis, the SSEF report would state ‘indications of heating’. Residues (e.g. borax glass) are additionally quantified as minor / moderate/ significant residue in healed fissures (and cavities, if present). Fissure filling of sapphires (e.g. with oil) would be disclosed as ‘minor / moderate / significant amount of oil in fissures at the time of testing’. For the correspondency between different terminologies, please also refer to LMHC Information Sheets 1, 3 and 5. Origin determination is an expert opinion. At SSEF origin determination relies on the analysis of microscopic features, trace element concentrations, and spectroscopic data of a coloured gemstone. The measured data pertaining to a specific client stone is then compared with our extensive reference collection and database of coloured gemstones of known origin, and scientific gemmological literature.